We're introducing a new members only club for our exciting and fun fans alike, where you can win weekly products that are featured on Smallnhot. Not only that, we also be giving away some exclusive experiences such as parties, holidays and more to our most engaging fans on Facebook and Instagram. It's simple...! the more you Like, Comment and Share with us on Facebook and Instagram the more stuff you will win ! CLICK HERE TO JOIN. 3.Winners will be notified via Facebook Personal Message (PM) and has to reply it within 24 hours, else prize will be revoked and new winner will be chosen. 4.Small N Hot reserves the right to substitute prize of equal or greater value at any time. 5. Prizes will be sent to winners via Email voucher or physical product via post within (Malaysia and Singapore) only. 6. Posting and delivery fees will be payed by the winner if the address is outside Kuala Lumpur. 7. All giveaway decision by Small N Hot are final and conclusive in all circumstances and no correspondence will be entered into. 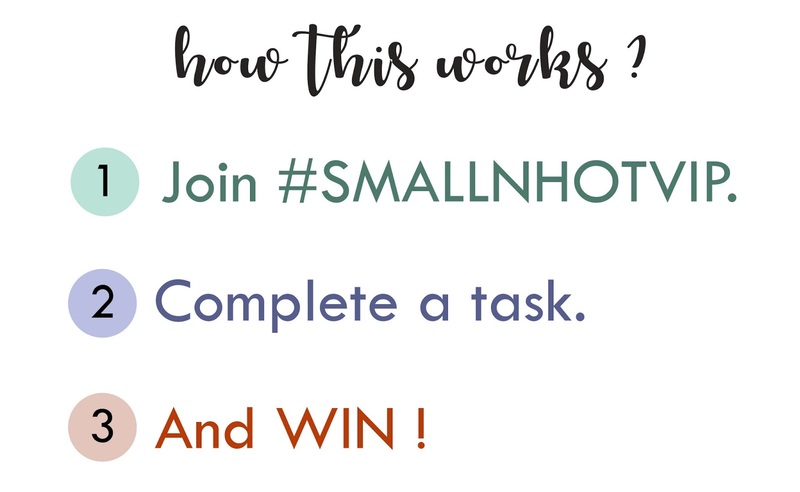 8.Small N Hot may change the group's terms and conditions without notice.